Selka, a young female sea otter, had a rough life before she ended up at UC Santa Cruz's Long Marine Laboratory. Stranded as a week-old pup, she was rescued and rehabilitated by the Monterey Bay Aquarium, then released into the wild, only to encounter one difficulty after another, including a severe shark bite, poisoning from toxic prey, and getting lost offshore. After multiple cycles of stranding, rehabilitation, and release, Selka was deemed unreleasable by the U.S. Fish and Wildlife Service (USFWS). In 2014, she joined Colleen Reichmuth's research program at Long Marine Lab, where she helped graduate student Sarah McKay Strobel study how sea otters find their prey. "We actually don't know anything about how sea otters find food underwater. We know what they eat because they consume their food at the surface, but they spend a lot of time diving and we really don't know what they're doing down there," said Reichmuth, who directs the Pinniped Cognition and Sensory Systems Laboratory. Working with Selka has helped the scientists learn how sea otters use their senses to find and identify things underwater (turns out she has a keen sense of touch, with both paws and whiskers). Selka also helped the researchers develop field methods for studying foraging behavior in wild otters. She is now back at the Monterey Bay Aquarium, being evaluated as a possible surrogate mother for orphaned sea otter pups. Meanwhile, other sea otters are helping scientists at Long Marine Lab understand why so many pups are being abandoned in the first place. 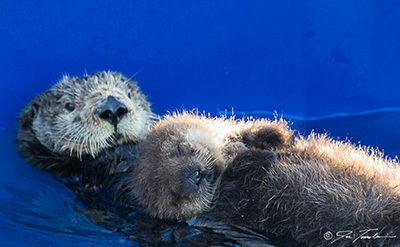 Terrie Williams, professor of ecology and evolutionary biology, and postdoctoral researcher Nicole Thometz are working with the aquarium's sea otter program to study how much metabolic energy it takes for a female sea otter to rear a pup. The answer is a lot, so much that some otter moms can't find enough food in the wild to sustain themselves and their growing pup. "The amount of food those females need to get a pup from birth to weaning is so enormous, conditions in the wild have to be perfect. And in some areas of Monterey Bay, there just isn't enough prey for them. That's a major reason why pups are being abandoned," Williams said. "We wouldn't know this without being able to study them at our lab. It has changed how we think about abandoned pups after they're rehabilitated. Should they go back into that same environment, or should we be putting them in more productive areas to give them a fighting chance?" Some of the animals Williams works with can be returned to the wild after participating in the research program. That's the plan for a pregnant female known only as "Old Lady." Around 13 years old, she was brought in by the aquarium with a horrific facial wound, inflicted by a male during mating, which left her unable to eat and likely unable to survive in the wild. When an exam revealed Old Lady's pregnancy, Williams and her team agreed to help with the rehabilitation and support the pregnant otter through the birth and weaning of her pup. In the process, they have been measuring her metabolism and caloric demands each week to better understand what sea otter moms in the wild need. Like an expectant family, Williams and her team are now anxiously awaiting the birth of the pup. "Our hope is to release Old Lady with her pup as soon as it's weaned," Williams said. "We want to release animals in a way that's consistent with their best chance at survival." Some animals just aren't able to make it in the wild, though, and have become long-term residents and research partners at the lab. For now, Long Marine Lab's resident animals are in temporary quarters during a major renovation of the marine mammal pools. Many of them are living at aquariums and at the California Department of Fish and Wildlife's Marine Mammal Veterinary Care and Research Center, located nearby on the UCSC Coastal Science Campus. A Hawaiian monk seal named Kekoa is among those temporarily housed at the state wildlife facility. An adult male nine feet long, Kekoa was removed from the wild because he was attacking monk seal pups and young females. The Hawaiian monk seal is one of the most endangered marine mammals in the world, with only about 1,100 left in the wild, so the loss of any pup or female is a serious blow to the species. "Kekoa was so destructive to the population, there were few choices for him," Williams said. "I agreed to take care of him sight unseen. I was nervous about it, but my fears were unfounded. Kekoa is one of our best research partners and has been amazing in our education programs, where he is now a star, teaching children about marine conservation." Much of the research Williams is able to do with monk seals at the lab, such as determining their aerobic dive limits, is directly relevant to conservation efforts. Interactions between people and monk seals along the Hawaiian coastline have caused some seals to venture further offshore into deeper waters. Research in the Williams lab is revealing details about the unique biology of monk seals that can inform the planning of marine protected areas to provide the best chances for the survival of the species. The backstories of Kekoa and Selka are not unusual among the animals in the research programs at Long Marine Lab. "A lot of animals have been given a second chance here," Reichmuth said. For a threatened species like the southern sea otter, it's discouraging when a young reproductive female like Selka doesn't make it in the wild or an older female like Old Lady is injured. By working with scientists, however, these individuals can still contribute to the welfare of their species by increasing our knowledge and understanding of their biology, including their remarkable cognitive and sensory abilities. Reichmuth's work with sea lions has demonstrated long-term memory and cognitive skills once thought limited to humans. She has also done extensive research on the hearing sensitivity of seals and sea lions, information that is important for understanding the effects of manmade noise in the marine environment. Reichmuth is currently studying the sensory biology and physiology of Arctic ice seals, which are vulnerable to disturbance from increasing oil and gas exploration and other human activities in the Arctic. Scientifically, the marine mammal researchers at Long Marine Lab have been enormously productive since the lab's opening in 1978. There's not always a direct line from these research programs to conservation outcomes, but so little is known about the biology of these species that just getting basic physiological measurements can be helpful in understanding the challenges they face in the wild. "I think it would be unethical not to use the opportunities we have to learn as much as we can in ways that are positive for the animals," Reichmuth said. "It takes a lot of training and close cooperation with these animals to reveal the hidden aspects of their biology and their sensory and cognitive abilities, and I don't think there's any other place in the world where we could do this kind of work." 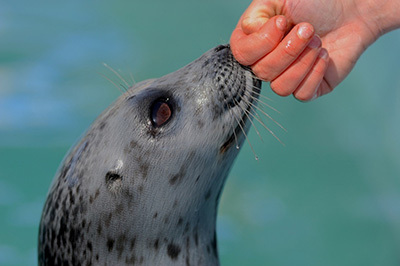 Research with the long-term residents at Long Marine Lab is based on a cooperative model that depends on a trusting relationship between the animals and the people working with them. In other words, the animals don't have to do anything they don't want to do. "It's empowering for the animals, because they learn how to make things happen in their environment," Reichmuth said. "We're nurturing their curiosity and enthusiasm, so it's very engaging, and that's why they seem so eager to participate in these studies." 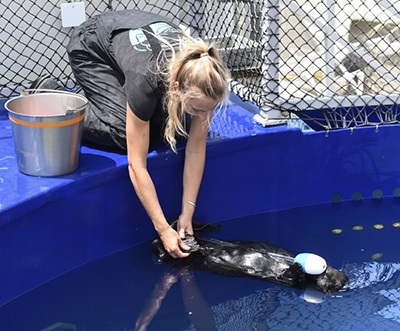 With all of the animals now in temporary quarters during work on the marine mammal pools, the pace of research activities has slowed at Long Marine Lab. Meanwhile, Reichmuth and Williams are worried about maintaining the funding needed to continue their unique research programs. It's expensive to keep the animals healthy and well fed, and tight budgets at federal research agencies mean grant funding is getting much harder to come by. "There is so much to be learned by allowing scientists and animals to work together, but everything is constrained by funding and opportunities," Reichmuth said. "Imagine how the nature of conservation would change if we could ask the animals what they need to survive in the wild," Williams said. "That is what we are doing in our lab." Funding for marine mammal research is among the priorities of the Coastal Sustainability Initiative, part of the Campaign for UC Santa Cruz.